I always felt like one of my strengths as a teacher was that I always had high expectations for my students. 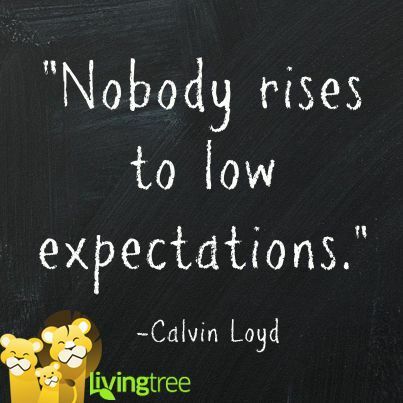 I never lowered expectations based on a specific class or student. I expected them to grow and make progress (at their level), to enjoy learning (most of the time-we all have our days), and that each of them had strengths that made our class the community it was. Students would rise to the expectations. There was never a reason to lower them. I tried hard not to underestimate what my students could accomplish. Yesterday, I was shopping with my daughter and I ran into one of my former pre-service teacher students from the university. She’s a super girl, appropriately candid and always asked great questions. She will be a fantastic teacher. She was in one of my first classes I taught, and we all know as teachers how first classes have the ability to create a special imprint. When I asked her how her semester was going, she replied with “It’s a joke”. Immediately, I jumped to the conclusion that it was a lot of work, that she was swamped and struggling to keep up, therefore: a joke. When I asked her some clarifying questions, I found that by “joke” she meant that her classes were too easy. She said she was able to get all her work done at her job, hence the reason she was out shopping instead of studying like a college student should. She said that she thought her classes would be more rigorous. Instead, she barely has any work to do at all. I’m not going to lie, I was a little shocked, but my pre-service students always continue to amaze me. It’s one of the reasons that I love teaching those classes. Then I realized that I had totally underestimated her because she is a “college student” and I had fixed her with a get-out-of-as-much-work-as-possible stamp, which was wrong of me to do. In this case, she WANTS to learn. She WANTS to be a great teacher. Her classes are not providing her with enough to keep her learning, and it’s irritating to her. IRRITATING TO HER that she can’t get the learning she needs to be awesome (which she will be anyway because she will make it happen on her own – she’ll be awesome in spite of school). I feel like we find that same thing with teachers in the field. They have a window where they are excited and want to do what’s best for their students but are not provided with the training and tools they need to move forward, so some burn out and some become cranky, but they don’t start out that way. As for the high expectations for students part, it was a good gut check for me. I was discussing this with a teacher at the beginning of school. He’s a great guy, came into the teaching field from the private sector and is doing his absolute best while not yet having his teaching degree (he’s working on that). When I asked him how it was going (he was first-year teacher exhausted, we can all relate) he said, “I don’t know. I think I just need to lower my expectations for how my students should act”. I told him absolutely not, if anything, raise them. Have faith that your students will rise to the occasion and will probably surprise you by bypassing your expectations and coming in with ideas and behaviors that are better than expected. Yet, I did the same thing with one of my students, underestimated her because she is a college student.